Our cantilever gates have earnt Frontline Automation an excellent reputation within the commercial market. The cantilever gate is our speciality and is essentially a bespoke product which we have based around established design features. Although the product itself is essentially a pre-designed item, the finished product is designed and then manufactured with the clients individual needs in mind. Sliding gates have become increasingly popular over the years as they offer a much higher level of security to swing gates - Especially against unauthorised access by intruders 'ramming' the gate system. 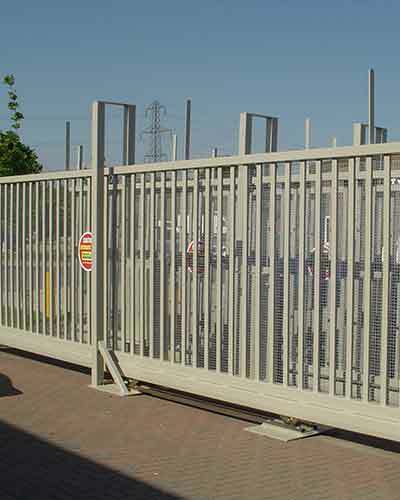 Cantilever gates are often more popular than the tracked sliding gates, for a variety of reasons. Cantilever gates have no ground track, which leaves the roadway free from rails and usually saves cost on groundworks. The lack of the groundtrack/wheels combination also means issues are not experienced when installed in a loose roadway surface where gravel or stones may fall into the groundtrack, causing an obstruction for the wheels. They are also ideal when the road surface is uneven, where a tracked gate would not operate efficiently/correctly. The cantilever gate is fully self-supporting and installation is a relatively quick and simple process. Foundations are required for the two posts (motor post and receptor post) and those posts are bolted onto the foundations. The gate operator/drive and controls are enclosed within a steel housing on the motor post. This adds to both the safety and security of the system, and helps protect the system against vandalism. There are a wide range of standard designs for the Cantilever gate which would compliment both modern and traditional styles, and to various security levels. All of our Cantilever Gates can be custom designed to match your requirements. For the commercial client in particular, our cantilevered gates act as the ultimate deterrent against intruders or unwanted visitors and can come with additional anti-climb features such as barbed wire, saw tooth, rotating anti-climb and anti-climb mesh infill. Turnstiles, Pedestrian Gates and Infill panels can be designed/Installed to compliment the system and/or allow for safe pedestrian entry/exit.